Bologna is one of Northern Italy’s most historic cities, but it’s a destination that has yet to fully emerge onto the Italian tourism scene – at least in comparison to much more popular locations such as Rome or Milan. 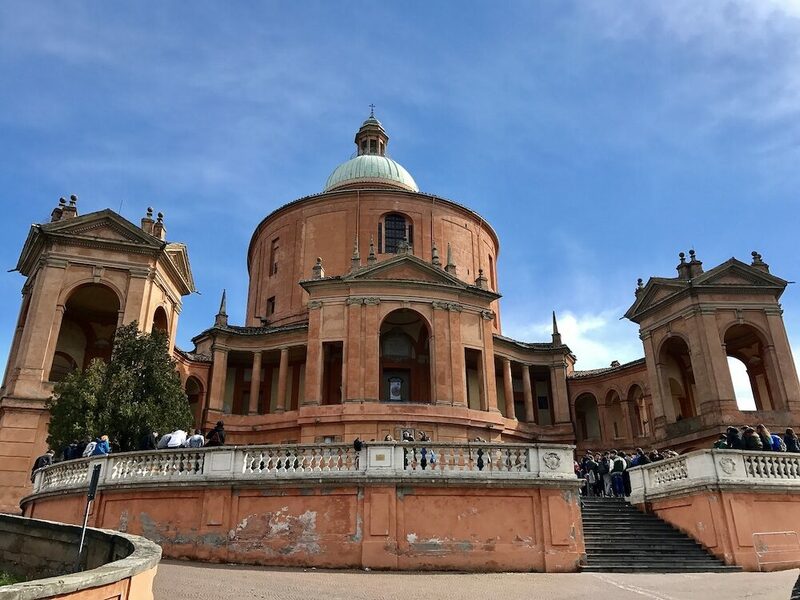 That makes this an excellent place to visit for travellers looking for an intriguing yet quieter location to explore, and you’ll quickly find that there are a lot of things to see in Bologna. Aside from being the home of Bolognaise, a dish that can now be found across the world, the city is also home to Europe’s oldest continually operational university. 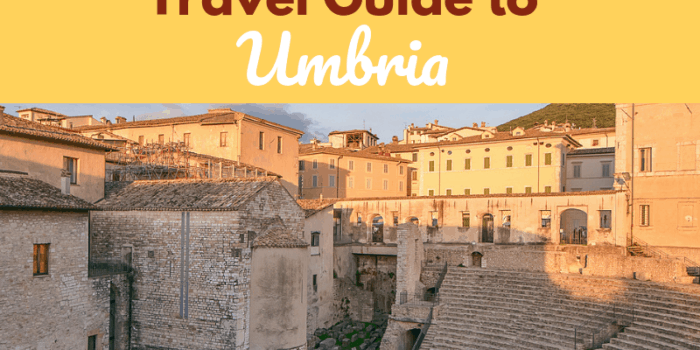 You can find leaning, medieval towers to match Pisa, a culinary scene that rivals anywhere else in Italy, and a vibrant culture that will intrigue and delight. 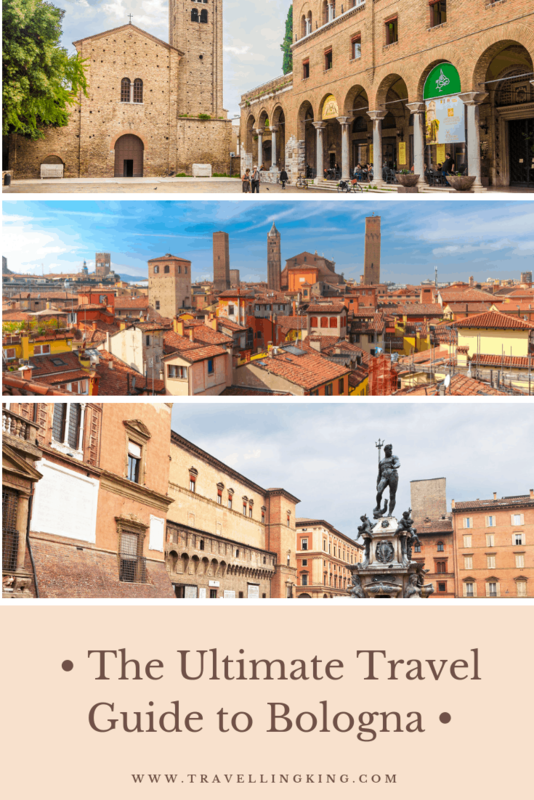 To help inspire your trip to northern Italy, this ultimate travel guide to Bologna will show you all the most beautiful places in Bologna, what to expect when visiting, where to stay in Bologna and things to do in Bologna which will help you in planning a trip to Bologna. 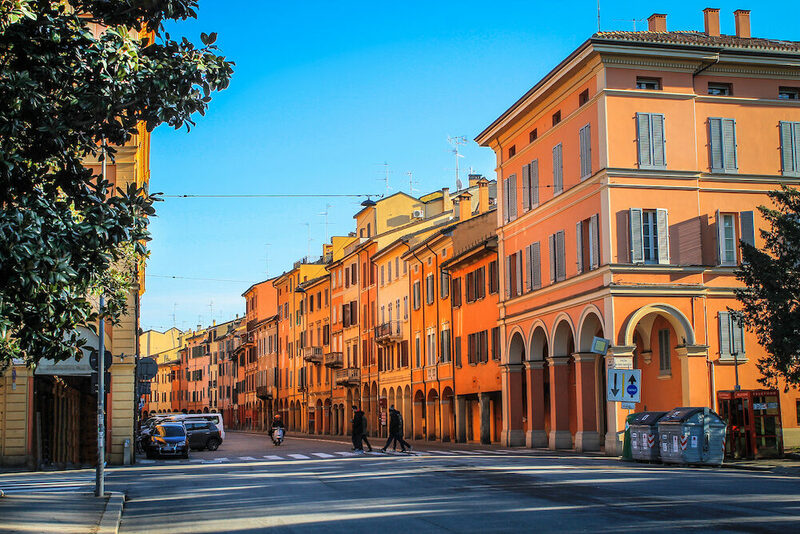 Bologna is the capital of the Italian Emilia Romagna Region, one of the country’s northern provinces. 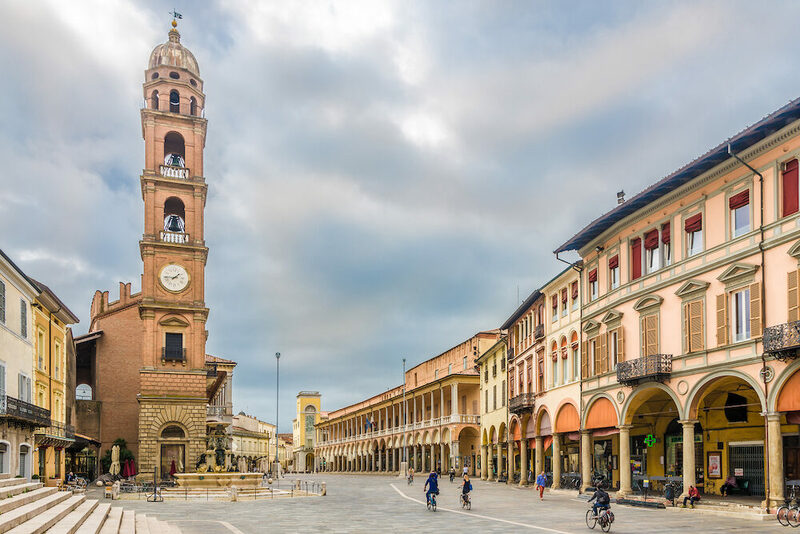 Being the largest city in the area, it’s a transport hub and has excellent connections across Italy and to the rest of Europe and of course the Romagna Region too. The city’s main airport is the Guglielmo Marconi International Airport, which has scheduled flights with most major airlines to other European cities, as well as domestically. 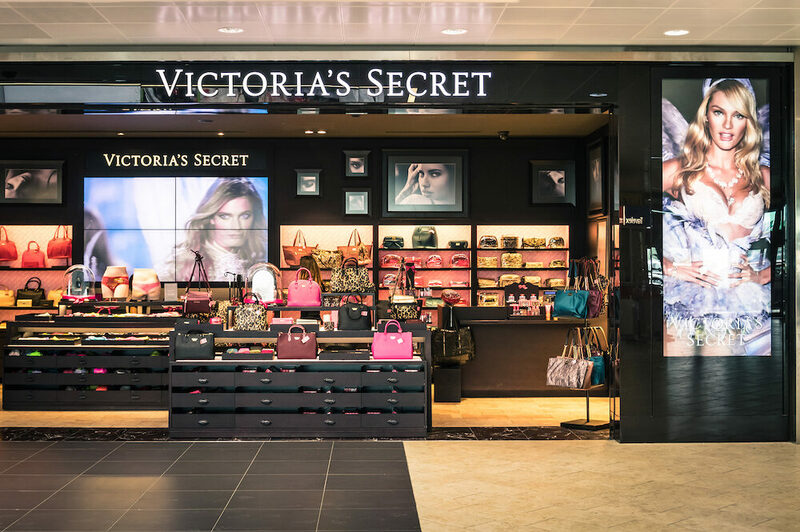 There are direct flights to most capitals, including Paris and London, and further afield to Istanbul and Dubai, allowing passengers to connect to almost anywhere else in the world. The Bologna train station is an important hub in the north of Italy, and it’s possible to travel to almost any major Italian city, and to most major European cities too. 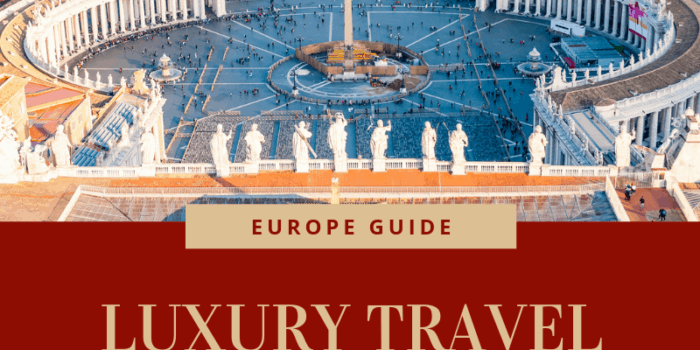 There are extensive bus connections too, with Rome being 4 hours away, and Milan just 2 hours of travel time to the north. Bologna’s historic centre is compact enough to allow you to walk around on foot and indeed, the narrow, medieval streets make this the best option to get from sight to sight when visiting. 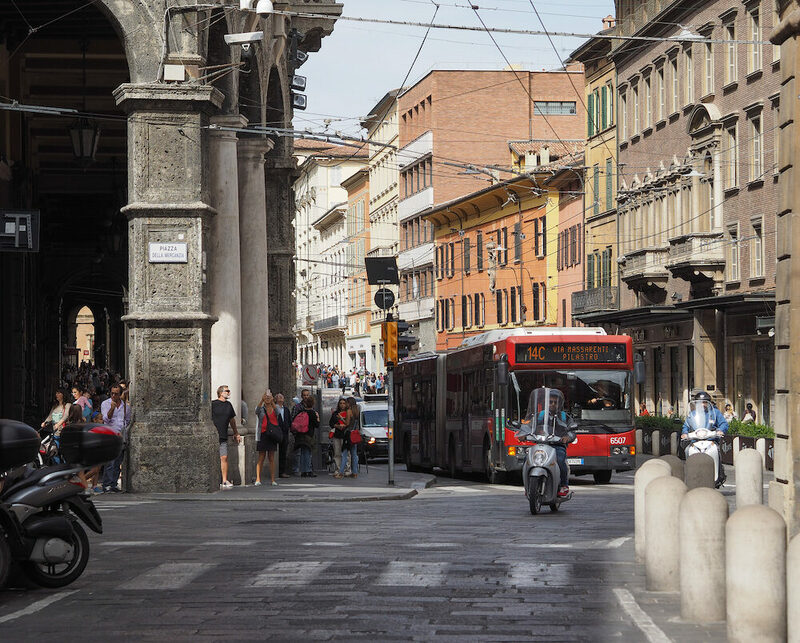 You will need at least 48 hours in Bologna to really experience everything there is to see, but rest assured that getting around is relatively simple. If you need to head into the suburbs or if you’ve had enough of walking, then there is an extensive public transport network in the city. There are trolleybuses and normal buses, and tickets are very inexpensive. 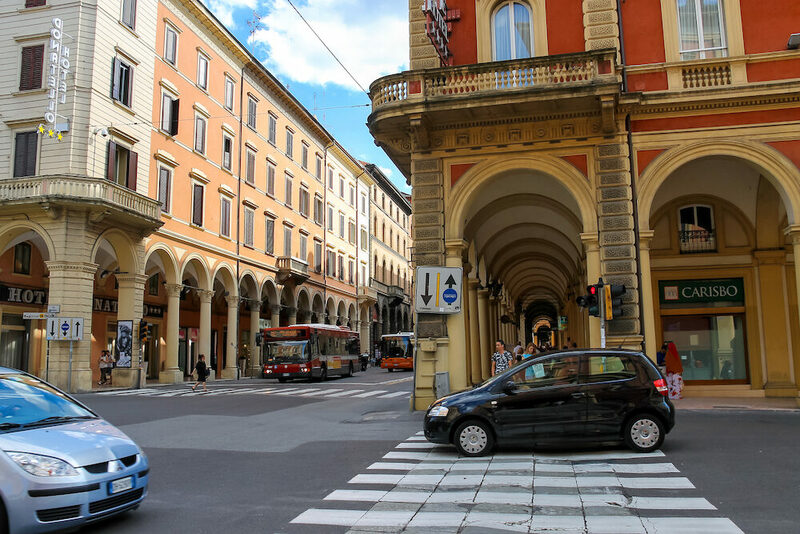 The station and the airport are all easily accessible via public transport, or taxi, to the city centre of Bologna. 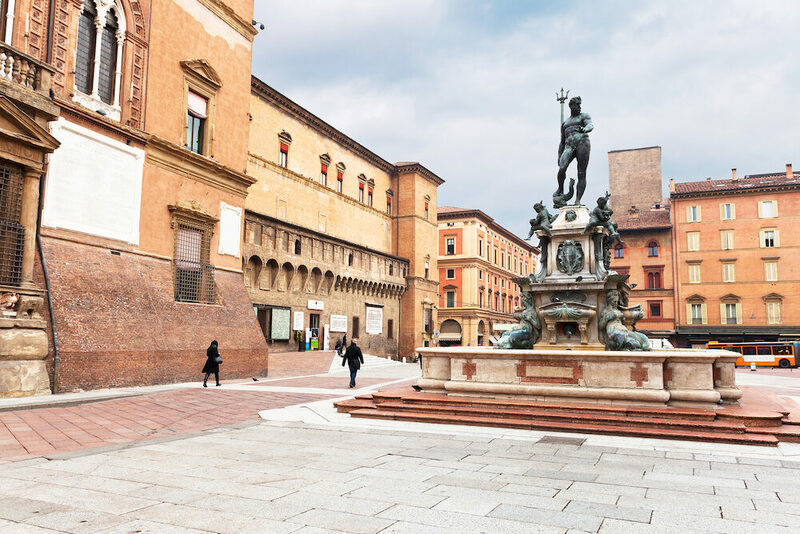 Bologna is a busy, bustling city, but you won’t find it to be overwhelming, with most of the attractions found within the older, historic areas. Compared to other Italian cities, Bologna sees much less tourism, and while this can be attractive for many travellers looking to experience a more off the beaten path destination, it also has its own challenges too. 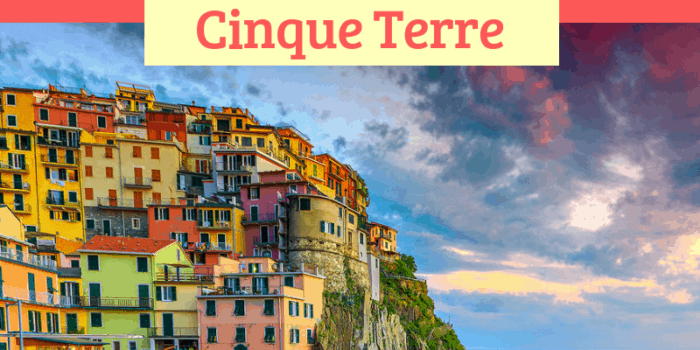 English will not be as widely spoken here, so be sure to brush up on your Italian, while hotel selections may be more limited too. 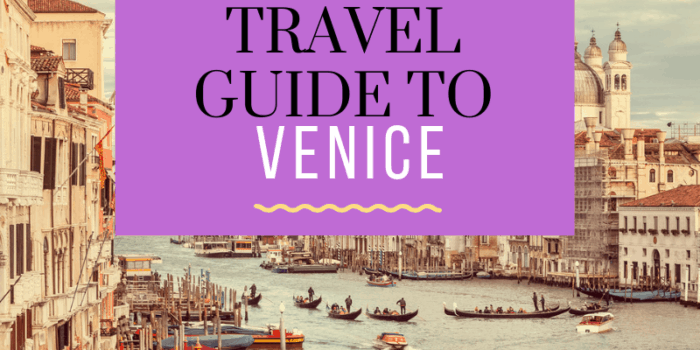 That being said, prices will be lower than Venice, Milan or Rome, and the streets will be quieter, and in many ways more authentic. Bologna, like the rest of Italy, uses the Euro, and you can find ATMs across the city and most major international credit and debit cards to be accepted widely. Bologna experiences hot summers and relatively cold winters, given its northern, continental location within Italy. Summertime, particularly during school holidays, can be the busiest time of year, and if you can travel outside of this period then you may enjoy the experience more. The months just before or after the peak summer season can be an excellent time of year to visit, with good weather – not too hot and not too cold – and fewer fellow tourists visiting the city. The Piazza Maggiore is the central square in the historic part of Bologna. The huge piazza is surrounded on all sides by medieval buildings, many dating back to the 15th century. You can find cathedrals and museums in the square, and at night, it’s lit up beautifully. Found next to the Piazza Maggiore, the Fountain of Neptune is one of Bologna’s most iconic works of art. Statues depicting the mythological god of the oceans, Neptune, with his distinctive trident, alongside other mythological characters, are found adorning the central fountain. 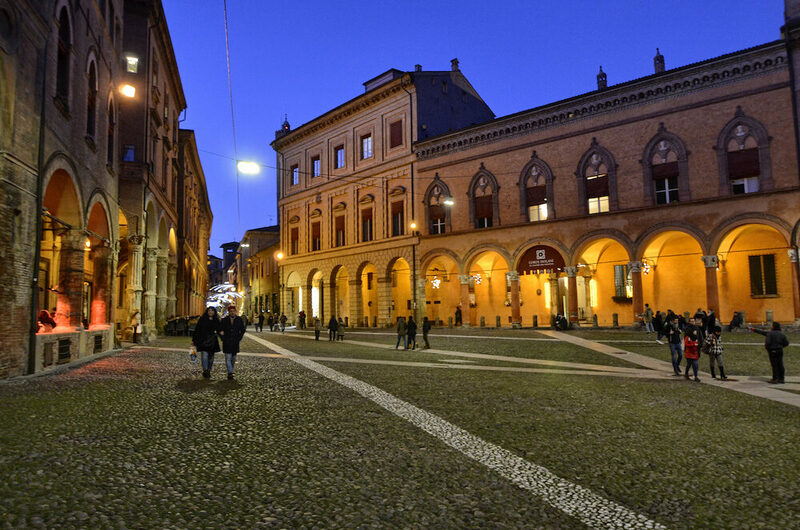 The Piazza Santo Stefano is another of Bologna’s most historic and popular squares. The piazza is fringed by churches and medieval buildings and is actually more of a triangle than a square as such. 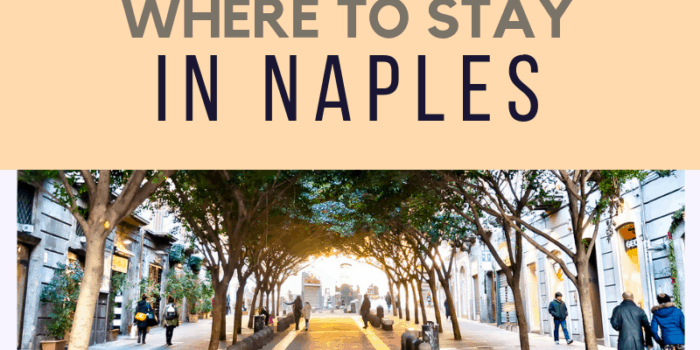 You can find plenty of great restaurants, bars and cafes spilling out onto the narrow, stone street, while on weekends market stalls are set up throughout Piazza Santo Stefano. Move aside Pisa, because Bologna has its own leaning towers, and they are much more off the beaten track attractions to visit. The two towers of Bologna are found along the same ramshackle street, and they tilt towards each other precariously. They stand out in the otherwise low rise historic centre and can be seen from all across the city. The most famous tower is called the Asinelli Tower, which is the tallest, while the slightly lower tower is known as Garisenda. 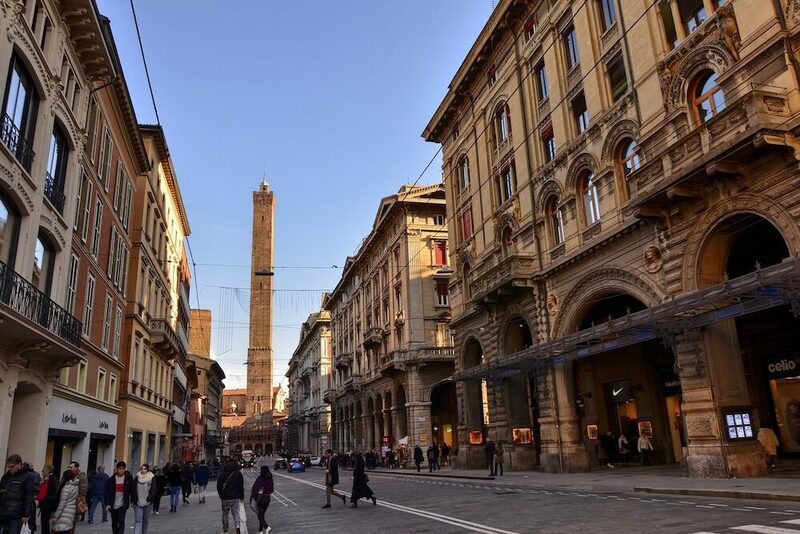 The towers are an important landmark in Bologna and date back to the medieval era. While few have survived, it’s thought there were almost 200 hundred of these tall brick towers across the city at the peak of their construction, a sight which today would be hard to imagine. The Mercato delle Erbe is one of the city’s largest and busiest markets, and it’s found right in the historic centre of Bologna. Explore the diverse stalls in this covered market place, purchase local fruit and vegetables, enjoy cheap yet excellent smoked or cured meats and sample the local cheeses. You can spend hours gorging in the Mercato delle Erbe, and if you need a few souvenirs to return home with, then this is the place to visit. The Santuario di San Luca is an important church that’s found in a prominent location outside of the city centre. Overlooking Bologna, the iconic basilica has long been held in awe by the people below, who would make the pilgrimage to the summit to worship San Luca. The first church to be built here was established over one thousand years ago, with the present church that you can visit dating back a few hundred years to the early 18th century. The patron saint of Bologna is San Petronio, and the basilica dedicated to his memory is found in the historic centre. This is one of the city’s most important places of worship, with the huge basilica dating back to the 14th century. Intriguingly though, despite it being the centrepiece for San Petronio, the front of the basilica has never been finished in over 700 years. 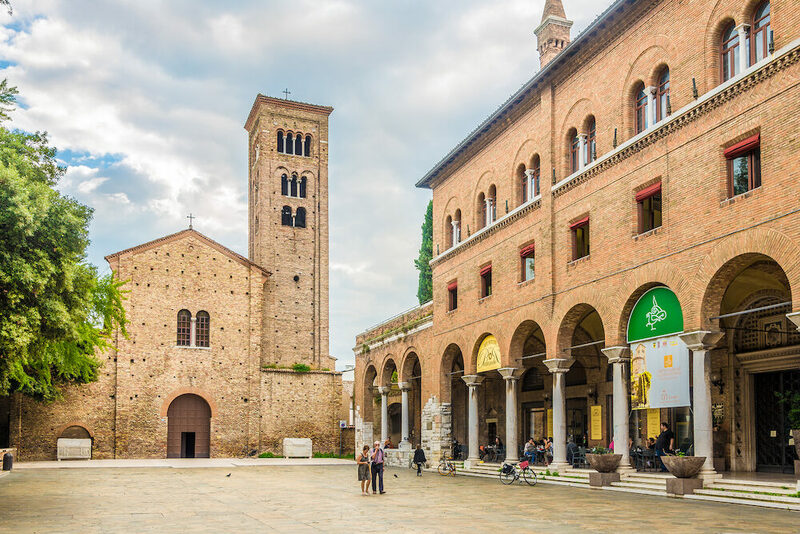 San Petronio was a bishop in the city in the early days of Christianity in the 5th century AD, and the intrigue behind the non-completion of his basilica is just one of the mysteries waiting to be unravelled on a trip to Bologna. You can begin to unravel some of Bologna’s mysteries though at the Bologna Archeological Museum. Found in the central square, in the Piazza Maggiore, the museum offers an insight into the region’s long and at times complex history, and you can find some fascinating artefacts dating back to prehistoric times, through the Roman Empire and into the medieval era. As well as local exhibits, there is also an extensive collection of relics collected from across the ancient world, in particular from Egypt. 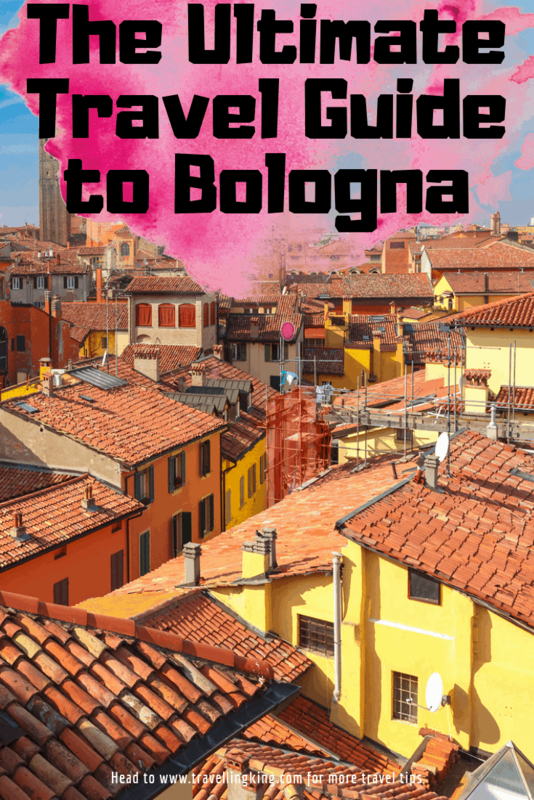 Bologna – like most Italian cities! – is a foodie paradise, and you’ll quickly fall in love with the vast array of authentic dishes ready to be eaten. Of course, no trip to Bologna is ever complete without a hearty portion of Bolognaise, and being the birthplace of the iconic Italian dish, there are few better places to try it. 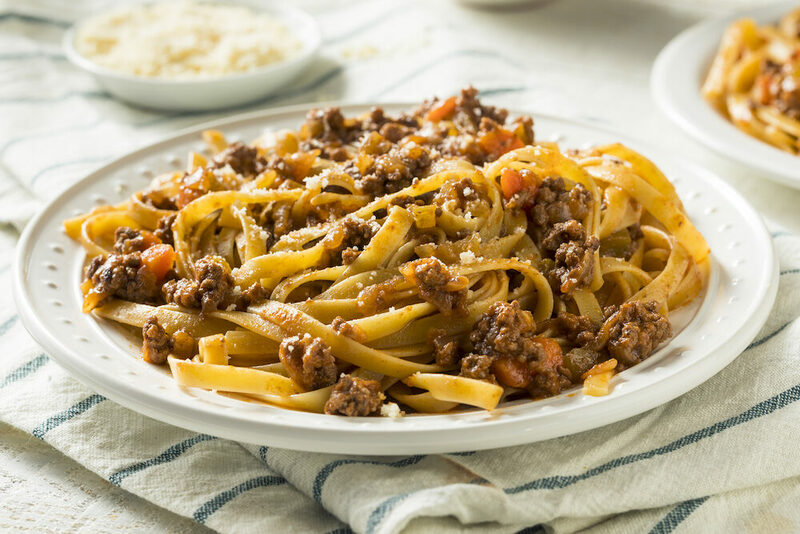 Compared to international versions, however, the Bolognaise here will be different, and the ragu sauce is usually just added to tagliatelle pasta. Aside from the Bologna Bolognaise though, Bologna food is incredibly diverse, and the city is often labelled as the culinary capital of Italy for this reason. You can enjoy huge plates of cured meats and cheeses – particularly Parmigiano Reggiano – delicious lasagne and of course, plenty of fine wine to accompany your meal. The Italian food here is exceptional, and to experience it all, you may want to sign up for a food tour around Bologna. 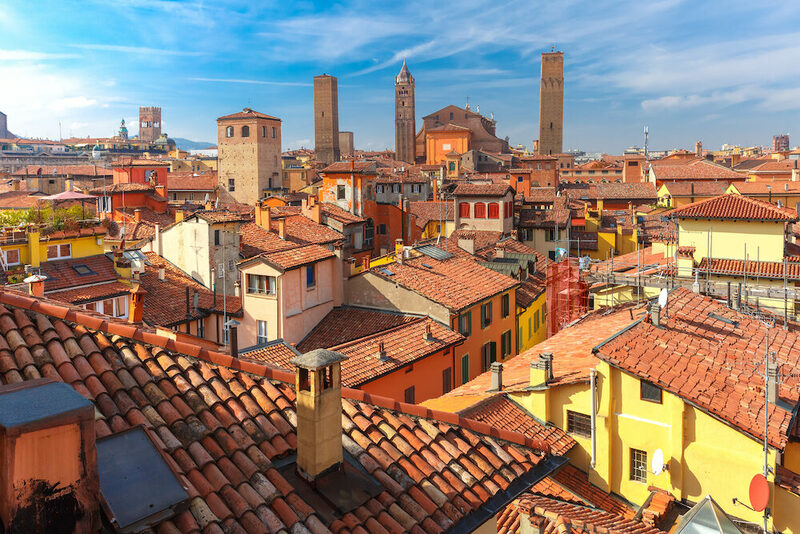 Bologna has a great range of accommodation, and you may find that prices here, particularly in low season, offer much better value than more traditional Italian cities – especially compared to the likes of Venice or Rome for instance. The city centre will be the best location to base yourself, allowing you to easily stroll around and visit all the sights, a bonus if you are just here for a short break or weekend getaway. The charming streets are wonderful to stay on, with great restaurants and bars found all over the historic area. You can find a few budget dormitories, but most hotels are aimed mid-range or higher. 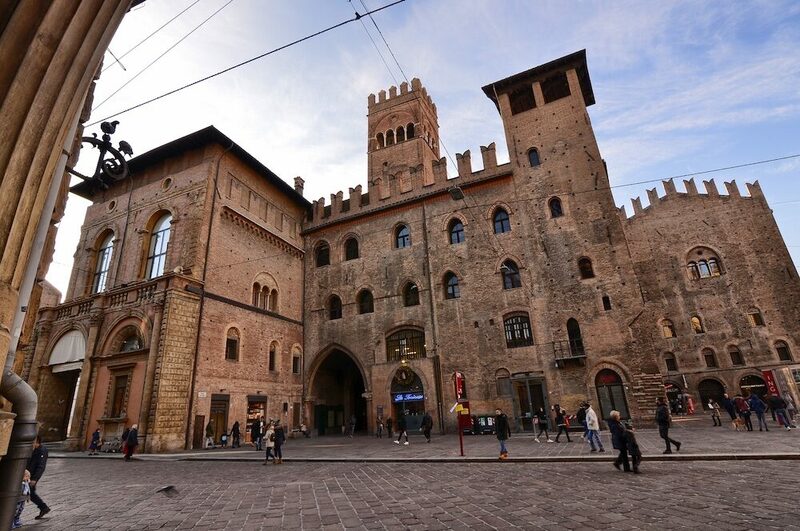 Bologna is perfectly suited for walking, so the best way to explore the historic centre is of course on a walking tour. Join a local guide as you are taken to the best sights in the city, and a few lesser known ones too. Explore the medieval buildings, piazzas and cathedrals, stroll through the historic streets and be immersed in the intriguing history of Bologna. 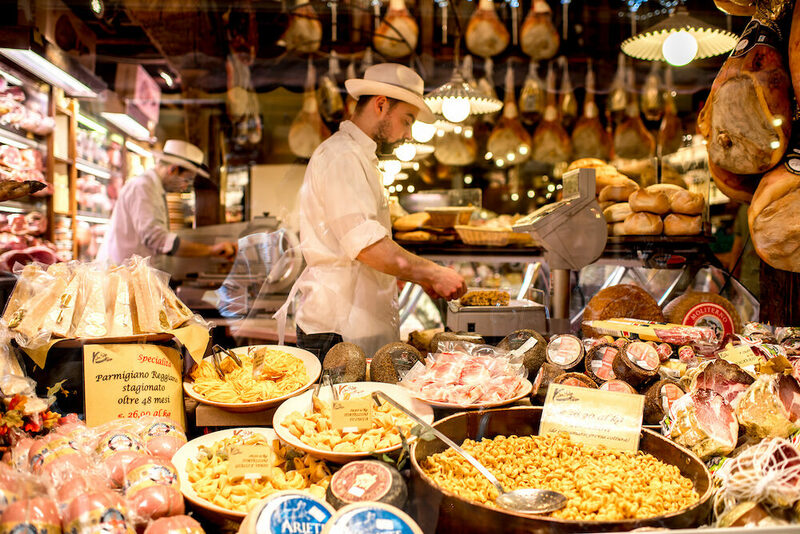 Experience the delicious cuisine of Bologna, as you walk off those calories by strolling from restaurant to restaurant on a culinary tour of the city. Learn about the rich foodie traditions in Bologna, try some of the best local eateries and be guided through the colourful market places as you eat your way through the city. 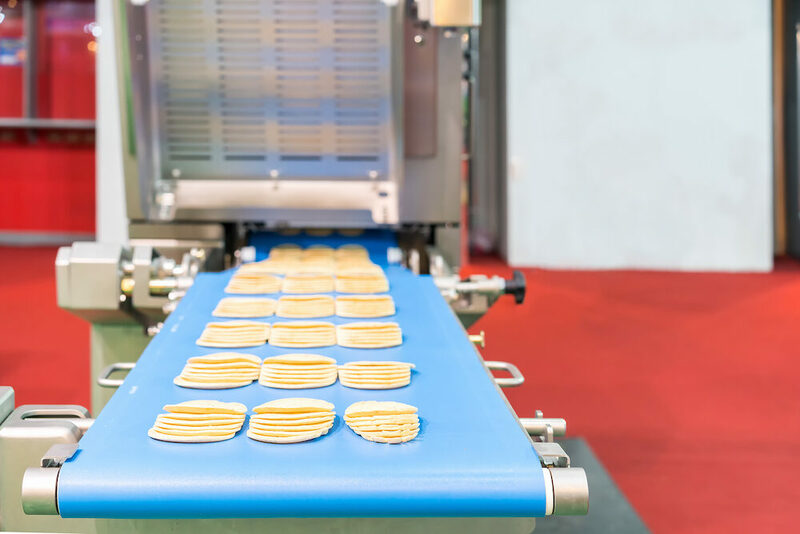 Bologna is all about the food, and you can even join tours that take you out into the surrounding region to visit the local factories and production centres, for a truly unique experience. 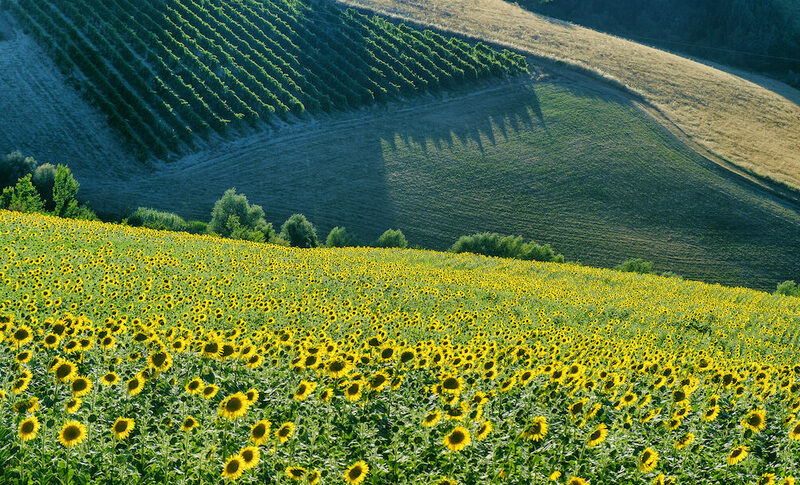 Visit the Parmigiano Reggiano factory, learn how local Balsamic Vinegar is produced, and of course, eat and drink all day as you delve into the food culture of the Emilia Romagna Region. Ravenna is located just a short journey away from Bologna on the east coast of Italy and is one of the country’s most historic ports. The city dates back thousands of years, and was for centuries one of the most important harbours in the Roman Empire, and even acted as one of the last capitals too before the fall of the empire in the 5th century AD. 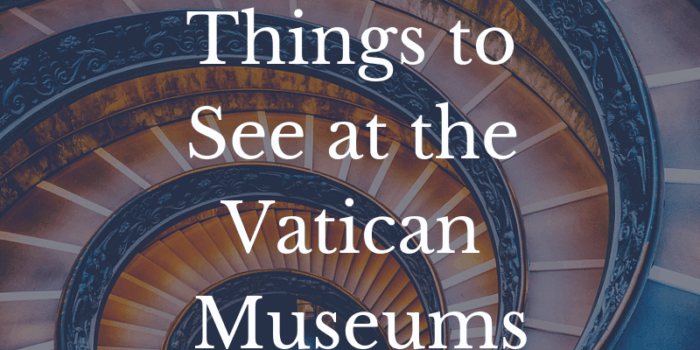 You can stroll through the old town, gorge on wonderful seafood and visit the many great museums found in Ravenna. 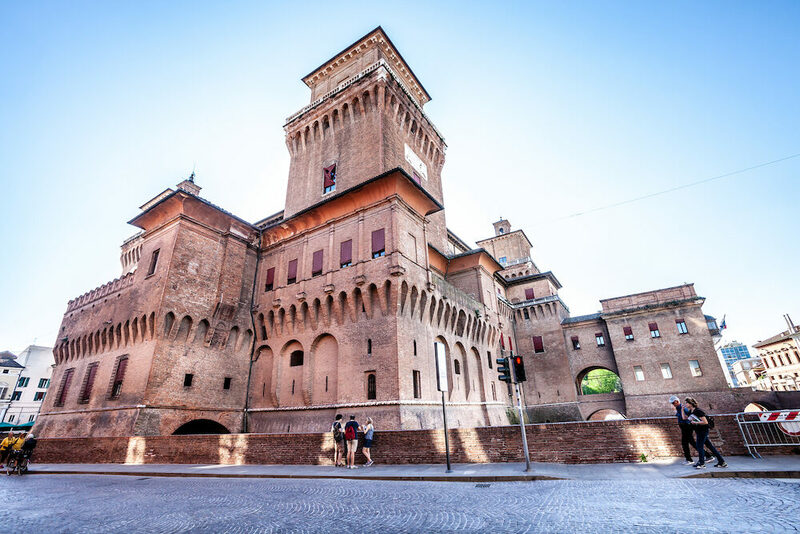 Ferrara is another large city in the Emilia Romagna Region and is located just half an hour away, making it the perfect place to day trip to from Bologna. It’s a spectacular place, one that’s been designated as a UNESCO World Heritage Site, and there is plenty to see. Visit the dramatic Estense Castle, the medieval cathedrals and the wonderful parks sculpted from the ancient remains of the city walls. 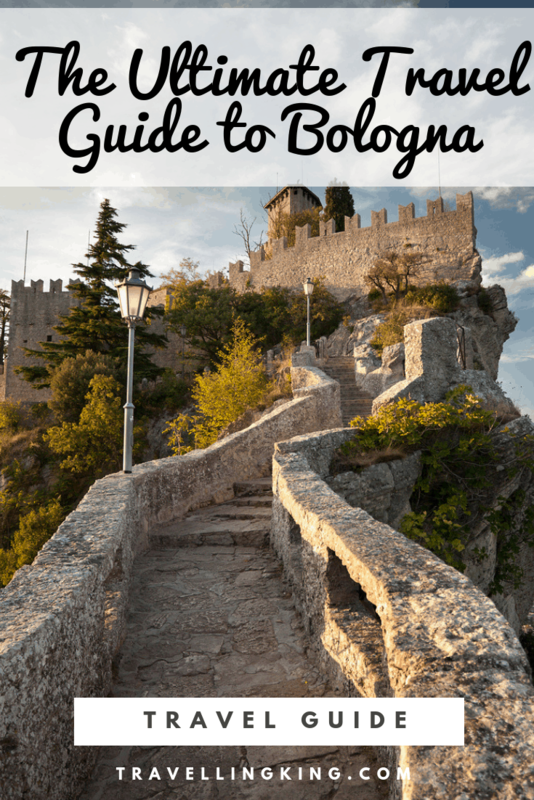 Why not visit one of the world’s smallest countries on a day trip from Bologna? This tiny city-state is located just one and a half hours away by car, and the rugged and mountainous location makes for a spectacular setting for the micronation. 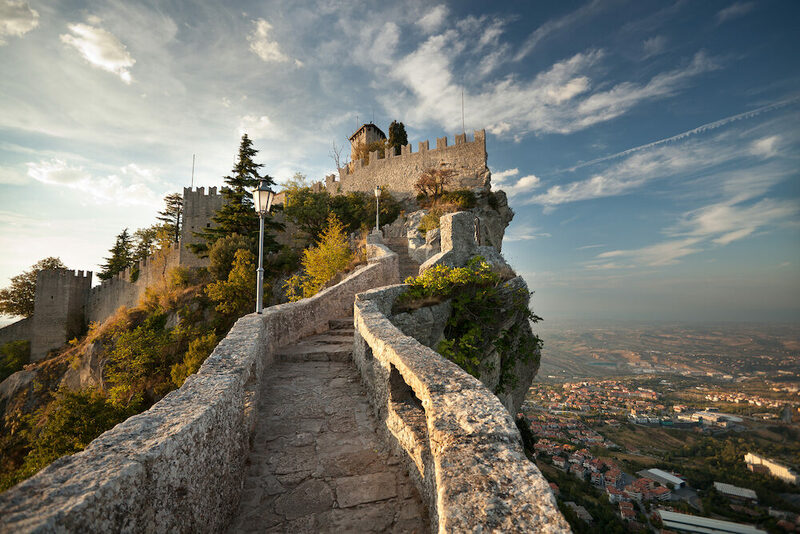 Get your passport stamped, visit the iconic mountain top fortress and discover the unusual quirks of a country that has a population of just 30,000 people.